No property owner wants confront the stress of fire and smoke damage. If your property has experienced a puffback, you may be dealing with ugly stains from soot and smoke as well as an odor that seems like it will never go away. And if you’ve experienced a property fire, the damages can be even more devastating. A fire in your home or business can mean extensive loss, widespread smoke damage, and even water damage. On top of all that, a fire is hard on your psyche. It’s hard to imagine a bright future when so much of what you’ve built has been destroyed. It’s okay. 911 Restoration is here to do the imagining for you. Our fire cleanup technicians have been trained to handle every single aspect of fire damage restoration, and they’re dedicated to restoring your property to better-than-new condition. Smoke and soot removal? They’re on it. Structural repairs? They’ll do that, too. Fire hoses have created a flood in your property? Our fire damage restoration workers are IICRC certified in water damage repair and mold removal. Whatever challenges your unique situation throws their way, these experts are prepared to handle it. Consider the fire cleanup staff your personal fire information center. They can answer any question you have. You don’t have to complicate matters by hiring multiple contractors and racking up costs. 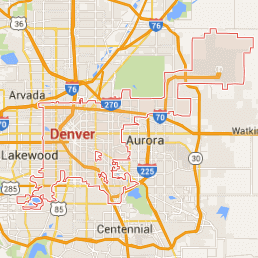 You only need one restoration company: 911 Restoration of Denver. If you’re standing in the destruction of your once-beautiful home or business, please be assured that it will once again feel like the property you’ve always taken pride in. All you need is the right ally. For comprehensive, compassionate service, call 911 Restoration today. Fire and puffback cleanup can be both varied and complicated. 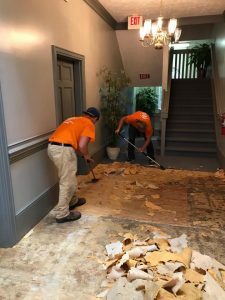 In order to get the best value and move on with your life as quickly as possible, choose a full-service fire cleanup company like 911 Restoration. When technicians arrive at your property, they first offer you a free fire damage assessment. This way, you have an immediate understanding of what your damages are and what needs to be done to restore your home or business. Then, they initiate fire cleanup. If you have any undamaged belongings remaining in the affected area, restoration specialists pack them out and store them away so they’re protected during cleanup. Then the crew will get to work on fire or puffback cleanup. They use sodablasting for full smoke removal, as well as eradicating all traces of soot, ash, and odor. They clean all surfaces of your property and even clean your dishes and furniture. Anything that cannot be cleaned, salvaged, or repaired is torn out and replaced. Your fire damage restoration experts don’t just restore; they reconstruct and renovate. 911 Restoration also accounts for water damages from fire hoses. If your property was flooded in an effort to put out the flames, the fire damage restoration team can take care of water extraction as well. They dry the structures of your home or business, repair damages, and inspect for mold that may have developed as a result of standing moisture. And if they find mold? They remove it using professional tools to ensure the threat of future growth is gone. The fire cleanup specialists at 911 Restoration know what your property means to you. They know how a fire or puffback can make the world you built feel a foreign and unfriendly place. Whether your needs are simple smoke removal and puffback cleanup or you require more extensive fire damage repair, an expert staff is standing by to help you. Reach out to 911 Restoration and let friendly fire cleanup specialists conquer the destruction and give you a Fresh Start. Does My Insurance Cover Fire And Smoke Repair? When your mind is already reeling from the stress of a property fire, the last thing you want to do is comb through the intricate details of your insurance plan. The fire cleanup experts at 911 Restoration get it. So they take every possible step to answer all your insurance questions. They take a look at your plan and help you make sense of your coverage. Then, they take claim filing off your hands and even assist with inventory listing and loss itemization. 911 Restoration accepts all insurance and will happily bill your provider directly. It can be difficult to find peace of mind when your property has been destroyed by a fire or is coated in soot from a puffback. We promise you, this moment is only temporary. 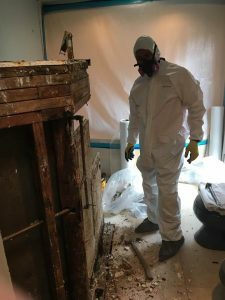 The damages can be repaired, the odor can be removed, and your home or business can feel better than new again with 911 Restoration of Denver on your side. Call us today, and let us help you get back on your feet.